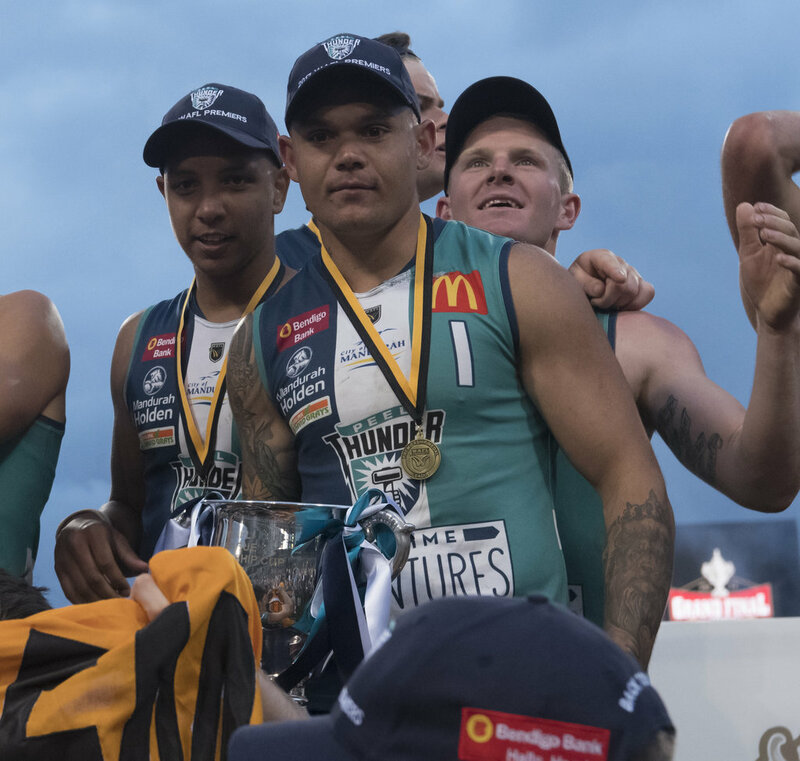 HIS move to Mandurah has proved the best decision of his life with Gerald Ugle becoming a dual premiership captain with Peel Thunder and now the only thing that would take he and his young family away would be a second AFL chance as he approaches game 100 in the WAFL. 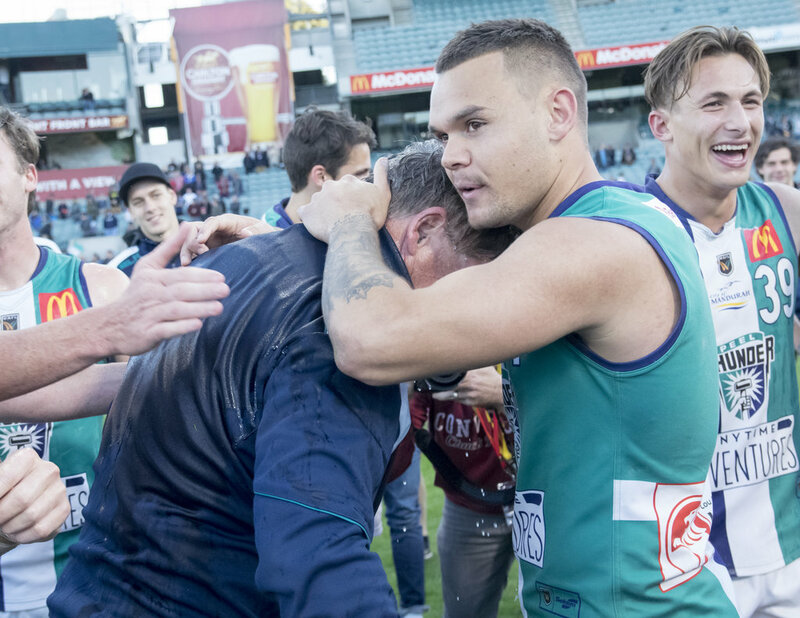 Being able to settle living in Mandurah with his wife, son and daughter now since making the move from Perth at the end of 2014 has proven quite the successful decision to make for Ugle both on and off the field. The result is that he has not missed a game since joining Peel for the 2015 season. He has played 79 of a possible 79 matches at the Thunder and that has included the only nine finals that the club has ever participated in. Not only that, but Ugle was appointed captain at the start of the 2016 campaign and at just 25 years of age, is now a dual premiership winning captain having led the Thunder to the promised land each of the past two years. That's quite the feat for the shy Beverly-native who attended Guildford Grammar from Year 9 onwards and began his WAFL journey with Perth after winning the reserves fairest and best award at Beverly in the Avon Football Association as a 15-year-old. Then after a 2010 season at the Demons where he both played State 18s for Western Australia and made his league debut, he was drafted to the Greater Western Sydney Giants as a 17-year-old to be part of the fledgling AFL franchise. 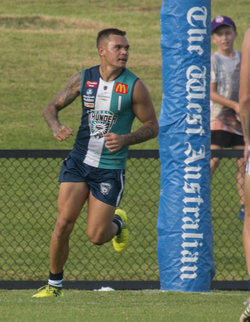 He would go on to play three AFL matches with the Giants before leaving at the end of 2013 and returning to original WAFL club Perth where he had a solid WAFL season in 2014. But it's been the move to Mandurah and joining Peel that has shaped his career. Having moved from Beverly to Perth to finish his schooling, then spending three years in Sydney and coming back to Perth, and settling down there for the past four years has turned out tremendously. "It's good to settle down and especially when my kids are starting to go to school and building friendships, but I haven’t given up on my AFL dream," Ugle said. "We'd still be happy to move as a family if that was to ever come about. I'm 25 this year and I still don’t want to give up hope on that as well. "Another opportunity in the AFL would be good and I feel as though I've matured as a player and person since I was at GWS. "If I was to ever get another opportunity it would be good, but at the moment this season I'm just trying to get the best out of myself and hopefully we can have another successful season. I just want to get the best out of my footy wherever I end up playing." Ugle does admit to it being somewhat of a shock making the move to Mandurah back in 2014, but he felt it would be best for his football. Now as he approaches his 100th game as a dual premiership winning captain, it's certainly turned out that way. "It was a bit of a shock early on moving down there because we didn’t know many people or the area really well, and it was a big change moving from Perth, and we've adjusted now," he said. "It was more because we saw it as a good opportunity to make the move and Cam Shepherd got me across and liked the way I played, and he rated me highly he said. "I thought the game plan he discussed would suit my game style as well so that was the main reason I made the move and I haven’t looked back since." 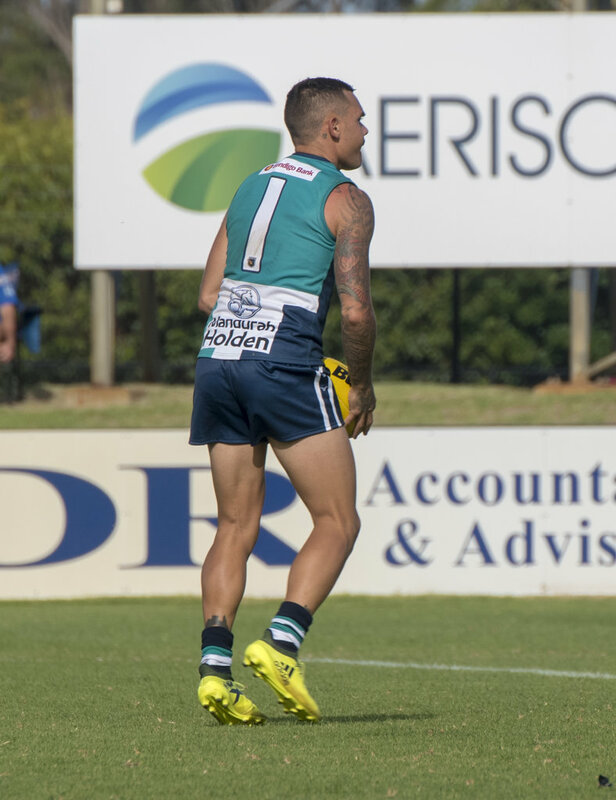 Ugle will celebrate his 100th WAFL match this Saturday as he leads Peel Thunder out against Swan Districts at Bendigo Bank Stadium. The 25-year-old is looking forward to the occasion and it works out nicely that Swans are the opponent with his first cousin Kirk Ugle playing for the black-and-whites. But Ugle is looking forward to the milestone and especially to run out with son Cade and daughter Summer with wife Shiana at his side. "Obviously you want to play footy at the highest level you can and WAFL footy for me has been great. To get to 100 games now is a massive achievement for me," Ugle said. "I obviously love playing down in Mandurah and especially in front of our home crowd it will be great to celebrate the milestone. I'm actually looking forward to it and I'll have a lot of family and friends coming down for it. "It's my fourth year down there now and my son has just started school in Mandurah this year. We'll probably stay in Mandurah for a while now as a family, we love it down there and we've built a good network since we've been there." As much as it's a big day for Ugle to reach his 100-game milestone, he is focused on the importance of getting a win for Peel. They currently sit in eighth position at 4-6 but a win on Saturday and they could even be as high as in fourth spot by the end of Round 13. "You always play to win and at this point of the season, it's vital for us to start winning games because you can see how tight the competition is for those fourth and fifth spots for the finals," he said. "We are still aiming pretty high this year and we have a lot of belief that we can string some wins together coming towards the end of the season, and hopefully finish a bit higher than we are sitting at the moment." It's fair to say Ugle was somewhat taken aback when appointed to replace the retired Brendon Jones as captain at Peel in 2016 entering his second season at the Thunder on the back of taking part in their first ever finals series, losses to West Perth and East Perth. But to think that he's led the Thunder to premierships in both his seasons as captain is quite remarkable. "I still pinch myself that I got elected captain when I did and I look back on the last three years as being captain at Peel, I've learned so much along the way," Ugle said. "It's been a great learning curve for me and it has helped me develop as a player and a person as well. I've loved the opportunity to be captain. "For me personally to hold that cup up that is one of the highlights of my whole footy career, AFL and WAFL. It's more of a team achievement and to hold that cup up there is no other feeling like that in footy. It's a big highlight for my career especially to have done it twice now." 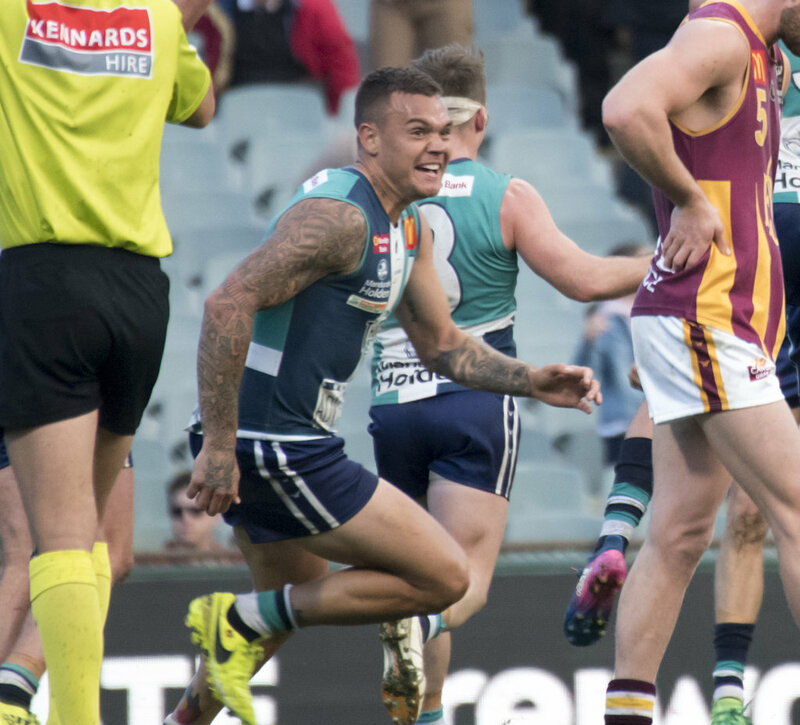 Another great source of pride for Ugle is that he has stepped up and played two of his best games since joining Peel in the two Grand Final wins the past two years against Subiaco. In 2016, he finished the premiership decider with 18 possessions and three goals, and then last year he produced another 12 disposals, four tackles and a goal. "All year you think about playing finals and the last couple of years my form during the season hasn’t been as good as I'd like it to be, but I've always taken pride in trying to play my best footy when it really counts," he said. "I think it's just a mindset thing for me and I work hard all pre-season and don't want to underperform when it does count in those finals games. I pride myself on performing in those big games." 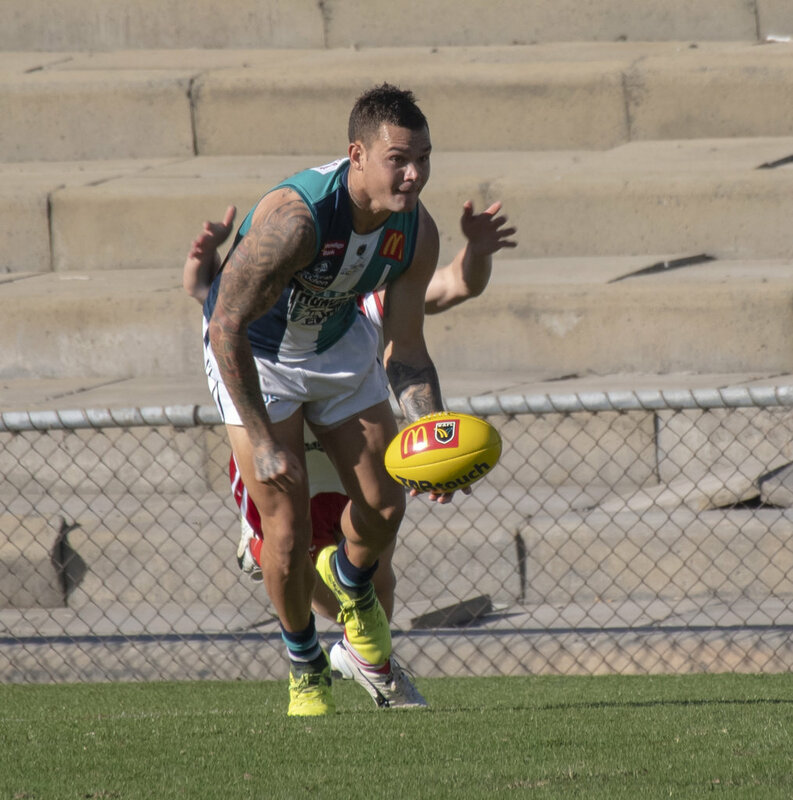 Ugle has already had a memorable 2018 season having been part of the WAFL State Team's victory against South Australia at Adelaide Oval as he now approaches his 100-game milestone. But he has missed the presence of teammate Leroy Jetta in recent times. "It's been pretty tough without Leroy down at the club. We are good mates and good family friends as well, so we are missing him down at the club," he said. "He adds so much to us and he's a great player, and I'm missing him up forward because we work really well together. Hopefully there's still a chance for him to come back this year. "It would have been good if he was playing this week because he was one of the reasons I came to Peel to play with him and I'm really missing him." As for life away from football, Ugle is enjoying seeing his children grow up and also the work he is doing with the Wirrpanda Foundation. "It's great working at the foundation. It's been good to help people and kids through our programs. We have already had some good outcomes with the programs I've been involved with which is good," Ugle said. "My boy has started Auskick now and he's down at North Mandurah Magpies where he's adjusting to it and it's new to him. It's great to go down there and help out whenever I can. "My daughter will be starting kindy next year too so we'll have two kids in school. Time flies but hopefully I can keep playing footy while they grow up and I think they are really looking forward to running out with me on Saturday."